Every now and then we come across a fantastic info graphic that just begs to be shared. 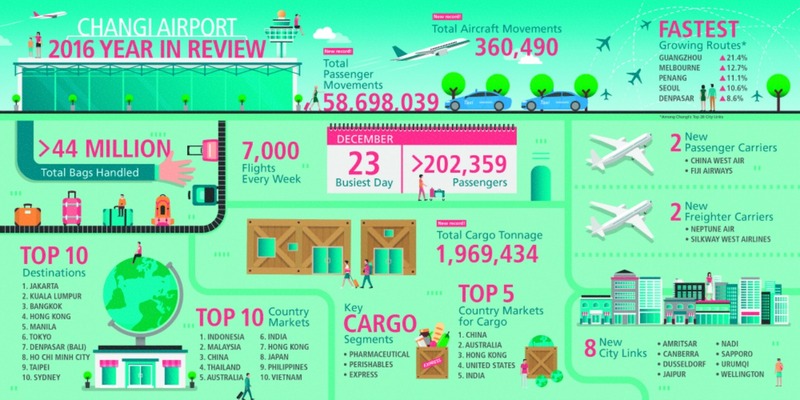 Today we’d like to show you the 2016 Year in Review of Singapore’s Changi Airport. If you’ve ever been to Changi, you know just how spectacular this airport is. With is wide open spaces, lush gardens and unrivaled features, it is certainly one of the most exciting airports in the world. Whilst the below figures are staggering (58,698,039 passengers moved!) we’re particularly drawn to the cargo information. Changi Airport moved a new record in cargo for 2016 with 1,969,434 tonnes of freight transiting through their terminals. Do you have a favourite airport? Comment below! Shipping containers on a plane?